Many of you will have visited Android Authority‘s Marshmallow and Nougat update trackers to see if and when your phone would get the latest Android updates. With all major Android OEMs now having updated at least one device to Android 7.0 or above, we can finally tally the results to see which Android OEM updated their phones the fastest in 2016. Google dropped Nougat on August 22 and the LG V20 was the first device to arrive running Android 7.0 out of the box. The Pixel phones arrived with Android 7.1 at launch, but almost all other phones had to be updated to Nougat. So who was fastest and who stumbled? LG took just 78 days to update the LG G5 to Nougat, doing so in South Korea on November 8. 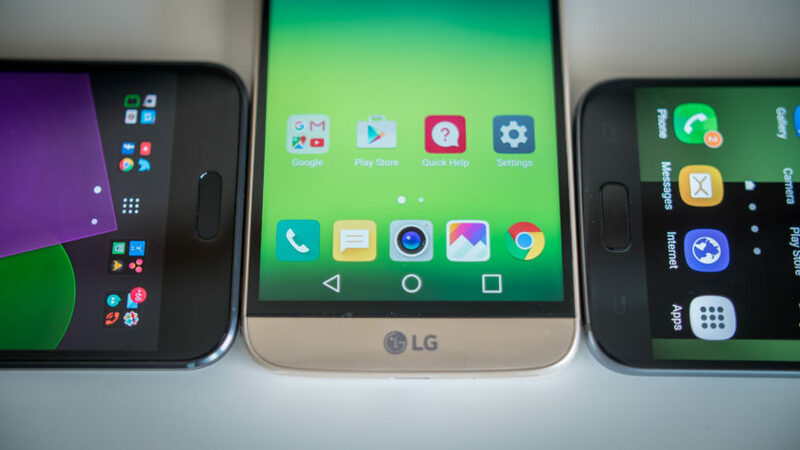 Less than two weeks later and the Sprint LG G5 was also among the first U.S. carrier devices to get the Nougat update, arriving on November 20. Nougat arrived for the first Canadian G5, on the Rogers network, one month later on December 20. LG also handled the Marshmallow update well, taking less than two months to get its first Marshmallow update out to the Sprint LG G4. Based on these two examples, if you want the best combo of OEM and carrier in 2017, at least where update speed is concerned, it’d be worth your while to consider the Sprint LG G6. Motorola’s stock-like interface has never taken too long to update and the bump to Nougat was no exception. Verizon Moto Z and Moto Z Force owners were treated to Nougat on November 18, two days earlier than LG and taking just 88 days in total. Canadian Moto Z’s got updated two days later on November 20. HTC has made some pretty bold statements about updates in the past, some of which were probably more hassle than they were worth. But with the Nougat update, HTC just quietly delivered. Unlocked HTC 10 owners got the update on November 25 and One M9 owners a few days later on December 5. HTC got the Nougat update out 95 days after Google released it. Sony just managed to scrape in under the 100-day threshold when it got the Nougat update out for the Xperia X Performance on November 29. The Xperia XZ started getting the update the very next day and the Xperia X and X Compact received the update on December 16. Almost an entire month later and Xiaomi dropped the Chinese version of the MIUI 8 ROM for the Mi 5 on December 26, 126 days after Google. Xiaomi joined the Nougat beta party in 2016, indicating the company is getting serious about rolling out timely and stable updates. OnePlus met its promised obligations for a 2016 Nougat update by a matter of hours, dropping a Nougat beta for the OnePlus 3T on the same day as the stable release started rolling for the OnePlus 3 and OnePlus 3T. That day was December 31, the last of the year and 131 days after Google released Nougat. Both the OnePlus 3 and OnePlus 3T will now share an update cycle. Samsung had a tough year and its update performance wasn’t much better. Taking 143 days to get the final version of Nougat out for the Galaxy S7 and S7 Edge – which only happened a couple of days ago on January 12 – Samsung clearly still has some work to do where update speed is concerned. Of course, Samsung also has a product portfolio far larger than everyone else on this list, but it also has exponentially larger resources at hand. Huawei still hasn’t rolled out a final Android Nougat update to any of its devices, but it did launch the Mate 9 a couple of months ago with Nougat out of the box. That said, it’s likely to be the last of all OEMs to get the update out to the first of its phones. The first Honor device, the Honor 8, is scheduled to be updated on January 18. Looking at the listed OEMs’ update response rate, it’s pretty clear that if timely updates are important to you then you should consider LG, Motorola, HTC and Sony first, all of which managed to get their first updates out in less than 100 days. Of course, getting one update out is only part of the story. Not all Android fans own a company’s flagship phone, so looking at how well each OEM supports its older flagships, mid-rangers and entry-level devices is also important (we’ll do so when more Nougat updates roll out). You carrier will also affect how quickly your phone gets updated. The quality of an update is also critical – we’ve all suffered through a rushed update job that causes more problems than it resolves. So being first doesn’t mean much if the update itself is rubbish. Then there’s security patches and bloatware to consider, and carrier additions and customer support can all affect satisfaction levels where update timelines are concerned. No one is perfect, but some are better than others. Which company do you trust the most where updates are concerned? Does speed trump stability?